The simplest feature of the editor is text formatting. When starting to create a template, you can easily add your desired message, then begin customizing its format, to make it look more polished. Before applying any format to your text, first make sure that it is selected. Once you have made your selection, click the button that corresponds to the formatting you want to apply; for example if you want to make your text bold or italic, simply press Bold or Italic, while your text is selected. The same can be applied when you want to change the color, font or size of a piece of text. To add a link to a web or email address; or to an in-text anchor, simply select your desired text and use the Link button on the editor toolbar. 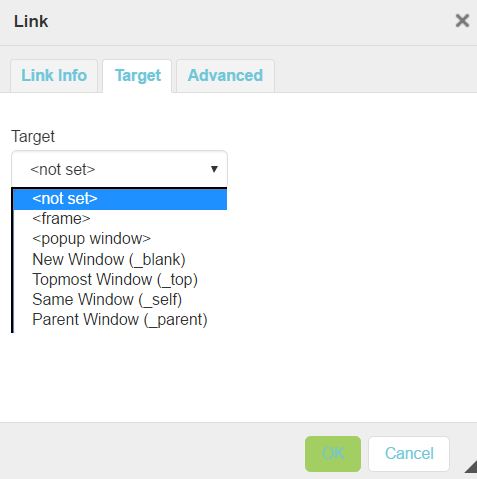 You will be presented with a window where you can set up your link. Under the Link Info tab, set the link type (URL for web addresses, anchor in the text or email). 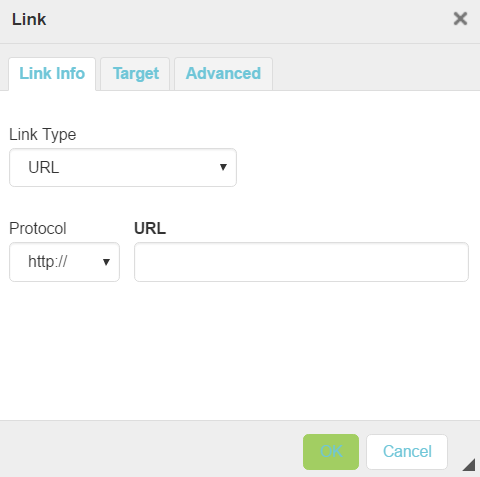 Under the Target tab, set the target window for your link: If you do not set one, the link will open in the current browser window. 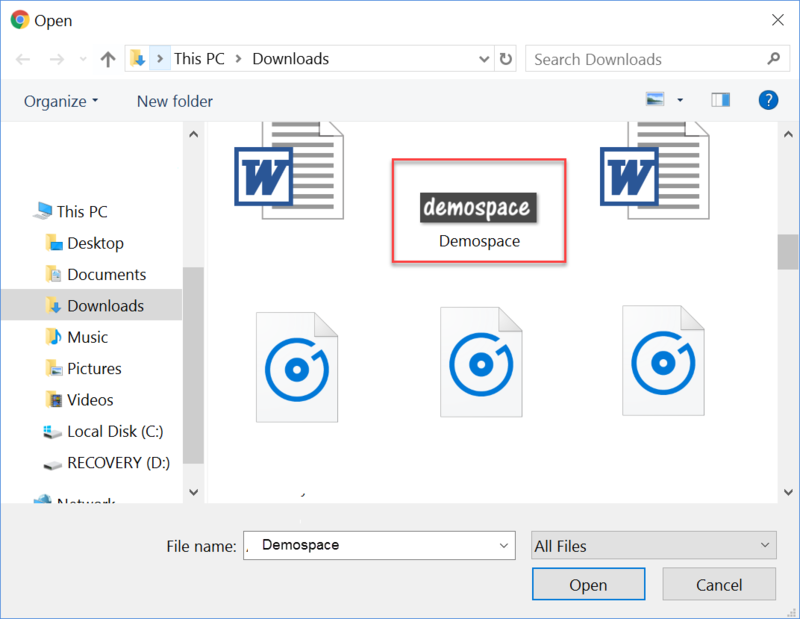 A commonly used target that you might want to use is the New Window option - which will open your link in a new browser tab, maintaining the current one open. 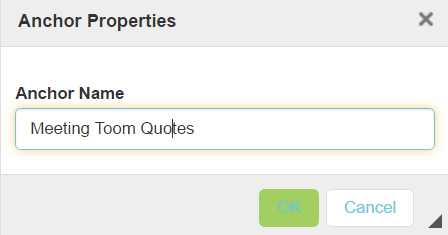 Use the Advanced properties tab to add more properties to your link, such as language text direction. Click OK to finalize your settings and create your link. You can use the Unlink button to remove the link. If you want to add links to different sections of your message, you can add anchors in your text, to which you can link at the top of your text. To do so, select the text that you want to set up as an anchor, then click the Anchor Text button in your Editor toolbar. Next. enter an anchor name. This will be displayed when you want to link to it, therefore, make sure to add a relevant name, that helps you identify the context by it. 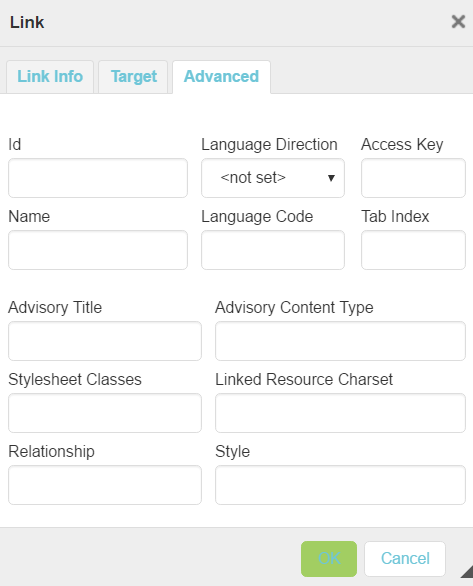 To link to an in-text anchor, use the Link option, then select Link to Anchor in the Text, under the Link Type dropdown list. Use the By Anchor Name dropdown list below, to select an anchor within your text. All of the anchors you have set up will be listed here. Click OK to save your changes. 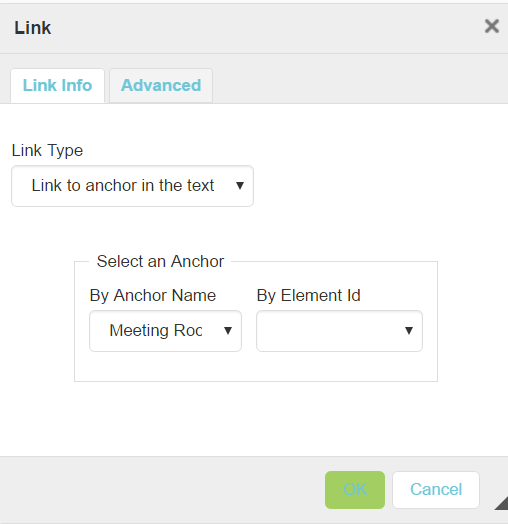 Now, the link you have set up will direct to the in-text anchor when clicked. Images can be easily uploaded using the image button. Next, browse your computer for the desired image. The image will now upload and appear inside your message, where your cursor is placed. To insert a table into your message, click the Table button at the top of your editor toolbar. Next, choose the properties of your table - you can set the number of rows and columns, add a header, set the border size, alignment, etc. 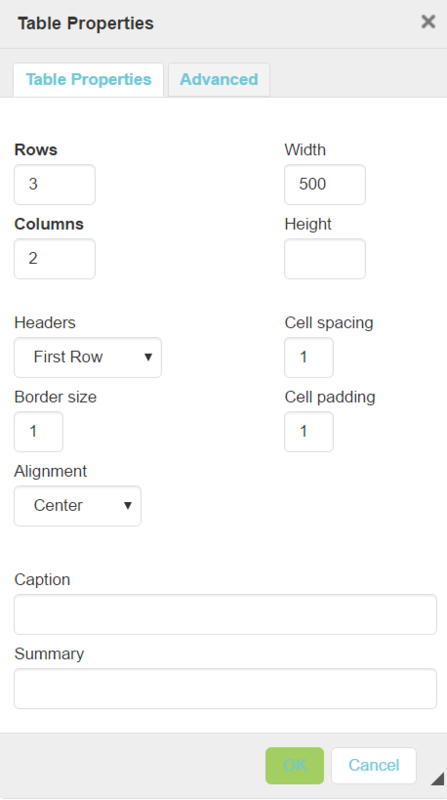 In our example screenshot below, we are setting up a centered table with 3 rows and two columns. 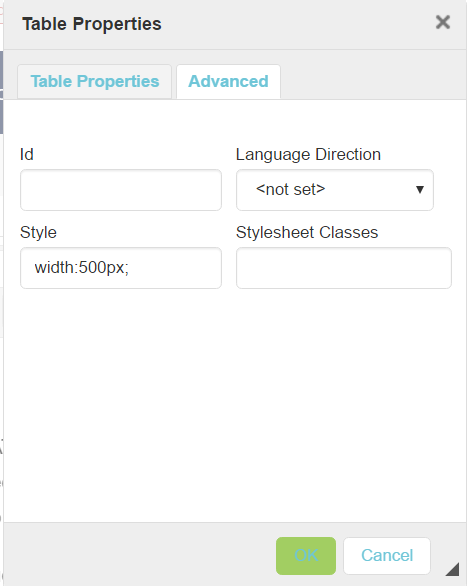 Under the Advanced tab, you can set more table properties, such as language direction or style.